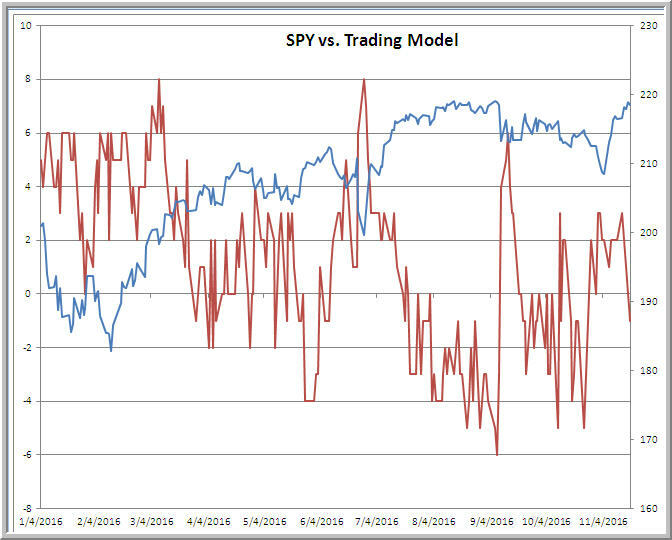 After a number of days in moderately bullish territory, the ensemble trading model has fallen back to a reading of -1. This is very modestly bearish over a several day horizon, and I take it more as an indication of a maturing trend than as an outright bearish signal. 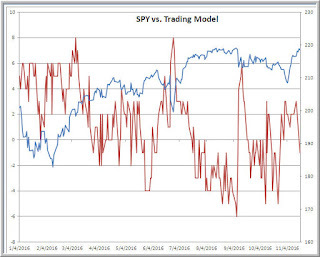 Indeed, as we saw in the rallies off the February and late June lows, the model will often pull back as a trend matures, with the upside continuing but moderating. There has been sufficient upward thrust to the present move--note the expansion in the number of stocks registering fresh annual highs--that such a moderating scenario is my base case. With VIX back to low levels and volume tailing off as we approach holiday season, I anticipate narrower trading ranges going forward--a change from the volatile action we saw after the election. The election has been a game-changer in at least one important respect for US stocks: there is a sense that policy is going to shift from the monetary realm (ever lower interest rates as a function of further central bank buying of bonds) to the fiscal one (increased spending/stimulus). That has changed the market's psychology from disinflationary to inflationary, resulting in lower bond prices (higher yields), a stronger US dollar, and a boost in stocks--particularly industrial and financial shares. With considerable cash on the sidelines, we could see a move out of bonds and into stocks, which would be supportive of continued market strength. Interestingly, my model of sentiment, which looks at a "pure" put/call ratio with recent price movement and volatility stripped out, has remained above average in bearishness. It is not clear to me that, despite the vigorous stock rally, that sentiment has become over-the-top bullish. Longer term, I harbor doubts that doubling down on debt will yield hoped-for growth. I felt that way when Democrats were proposing further spending, and I feel that way now that a Republican package is likely to come early in the year. That invites the possibility of stagflation and could return attention to (lofty) stock valuations. For now, however, we are responding to an anticipated fiscal boost and that has kept selling pressure quite modest, even when we've had short-term pullbacks.